With Heaven Sent you are guaranteed fast, friendly, and professional service. I give 100% to each and every client. EXPERIENCE! I have been in the birth industry for 10 years and providing placenta services for over 6 years. I have had the honor of serving over 700 families with placenta services. SAFETY FIRST! Anyone can provide placenta services but are they following safe sanitization processes? I have gone through extensive training to ensure that I follow the strictest of guidelines when it comes to the sanitization of my work space and equipment as well as proper handling of your placenta. I'm Blood Borne Pathogen Certified as well as ServSafe Certified. And follow all guidelines set forth by OSHA. In addition I have continued my education by attending yearly placenta conferences where I learn the most up to date research being done on placentas and placenta encapsulation. Having been well established in the Phoenix area I also have a positive reputation with health care providers. You can trust Heaven Sent to know exactly how to handle your placenta in a way that respects your health. Placenta encapsulation is the process of transforming a fresh placenta into a capsule form. The encapsulation process begins with complete dehydration of the placenta, powdering the desiccated placenta and then encapsulating the powder into empty capsules. Maternal ingestion of the placenta has been practiced in various cultures around the world for thousands of years, and is even considered the norm in some cultures. The entire process is typically done within 48 hours or less. "I could go on for days about just how wonderful both Amanda and the placenta encapsulation process were! There is no question that she was born to do this line of work- she is a natural! She was incredibly knowledgeable and supportive throughout the entire pregnancy process. My husband and I were moving across country just weeks after our babies birth, so it was very important for me to take the best care of myself. After speaking with Amanda, and doing my homework, I felt that the placenta capsules would be a great benefit. Amanda provided them to us in no time following the birth, so I was able to start taking them shortly after. I experienced a quick recovery, had lots of energy, and no drastic drops in hormones. I would do it all over again, and wish that Amanda were closer for our next baby! You will be so grateful to have her with you during such a special and intimate time in your life!" "Amanda is absolutely wonderful!!! She helped out so much with anything my husband and I needed. She went way above and beyond with getting my placenta encapsulated for us, even when we had unexpected situations arise with having to go to the hospital. She also got my beautiful happy pills, placenta print and cord keepsake back to me so quick!! I will never have my placenta encapsulated anywhere else! If you are thinking of getting this done, please do. Amanda can help with any questions you have. She is so knowledgeable in so many different areas. I am very blessed to have had her create these wonderful pills and keepsakes for me. I cannot wait to have her help us again with our next baby! :) Thanks Amanda, we love you!!! xoxo"
“Wow what can I say, Amanda provided an amazing service and experience for me. After speaking with many different encapsulation service providers, I felt that Amanda would provide the best, most efficient, and hygienic service. She was so helpful in explaining the process of what she does and how she handled my placenta. I loved that she offered herbs and other services like the placenta stamp keepsake and the cord heart. I would highly recommend Heaven Sent Placenta Encapsulation Services to anyone looking to have a wonderful experience encapsulating their placenta. "I found Amanda online and saw that she got great reviews. The process to set up the encapsulation before birth was quick and easy. Amanda returned my placenta capsules very quickly after birth so that I could start taking them ASAP. The presentation was adorable (super cute gift bag and darling bottle to store the pills in) and makes me happy every time I go to the fridge to take a pill. I also was surprised with the sweet and sentimental cord keepsake. My baby is now a week old a and I have tons of energy, sleeping great, no sign of baby blues/postpartum depression and tons of milk! I am so grateful for Amanda and Heaven Sent!" "Thank you very much for my “Happy Pills.” I wish I would have done this my first pregnancy. I was worried about having a huge hormone drop being pregnant with twins this go-around. It has been 3 weeks since their birth and I can honestly say that I feel better than I could have ever imagined. I have energy, I feel balanced, and I have been healing faster and dropping weight quickly. I attribute it all to your services. Thank you very much for helping me restore balance!! Love, love, love Heaven Sent Placenta Encapsulation Services. " "Amanda is so good at what she does! Not only is she prompt and professional, she is also very warm and caring. I know she puts her heart and soul into her business because I've seen it first hand, both as a doula and as a client! I've referred many of my clients and friends to her because of the high level of quality she provides. When it came time to choose an encapsulator for my own birth, she was my first choice. Love you, Amanda!!!" 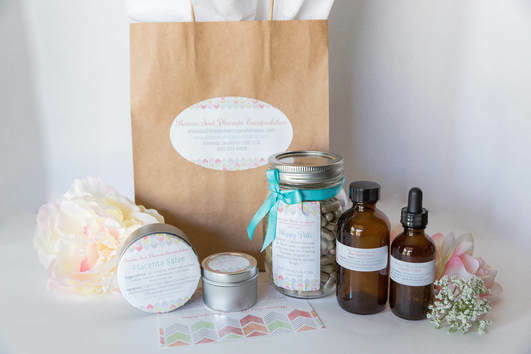 "I hired Heaven Sent Placenta Encapsulation for my most recent birth. I decided to do placenta encapsulation because the benefits are amazing. My family has a history of depression. The placenta pills help stabilize my mood and make me feel great post partum. Amanda is a true professional and had my product to me in a couple of days. I'm completely satisfied with the level of service I received." "Amazing service, I delivered 2 weeks early and Amanda was able to have my pills ready the next day! I feel incredible! I had problems with supply with my first child, with this baby my milk came in before I left the hospital!"